There is now a potential alternate route through the Crimean peninsula for South Stream, which would halve the cost of the marine part of the project. Crimea’s incorporation into the Russian Federation could dramatically improve the parameters of the South Stream gas pipeline project. There is now an alternate route through the peninsula, which would halve the cost of the marine part of the project. The South Stream export gas pipeline has been subjected to harsh criticism in the past because of its controversial economic efficiency. Firstly, at 16 billion euros ($22 billion) its cost is one of the highest in the history of pipeline construction. Secondly, the project is technologically very complicated and fraught with environmental risks that arise when pipe-laying in deep water (up to 1.55 miles, the world record in this area). In 2011, when major environmental assessments were carried out, project documentation was prepared and the first investment agreements with the countries participating in South Stream were concluded. When it became clear that Moscow had made a firm decision to build it, the Ukrainian government proposed a route for the pipeline in Crimea and further down the more shallow northern portion of the Black Sea, which would reduce the budget by two and a half times. Gazprom rejected these options, pointing out that since they did not exclude transit risks, they did not solve South Stream’s main problem. Today, with Crimea now a part of Russia, transit risks are no longer an issue. The average depth of the pipeline on the current design (in the middle of the Black Sea, in international waters) is 1 mile and reaches a maximum of 1.4 miles. The length of the coastal plain is 595 miles. From the open project documentation it is known that the construction budget consists of two parts: 5 billion euros ($7 billion) has been allocated for 1,056 miles over land and 11 billion euros ($15 billion) for the 595 miles by sea. Let us now look at the adjusted route parameters: The length of the sea zone is reduced by half, to 300 miles. The average depth in this area of the Black Sea is 1.6 times less – 0.65 miles, and the maximum is 0.9 miles instead of 1.4 miles. According to estimates made by the same European experts, an alternative sea route would cost 3.6 billion euros, to which the roughly 260-mile section in Crimea itself would be added (still about 1.2 billion euros). The total costs of the Crimean alternative of the offshore section would thus amount to 4.8 billion euros ($6.6 billion), which is almost half the cost of the offshore section’s current version. Officially, the gas monopoly has not confirmed the plans of the route’s correction, and according to its press service, Gazprom is not considering changes to the route. 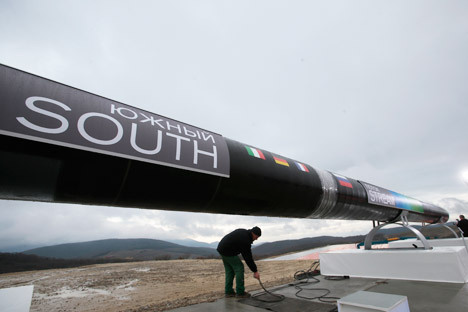 “South Stream is primarily an export gas pipeline. Its construction goes together with its foreign partners, which also includes financing part of the project. The configuration change will necessitate renegotiation conditions for participation and lead to the disruption of its implementation schedule,” said the statement from Gazprom’s press service. “The approved deadlines for the commissioning of the pipeline do not allow for new research to be conducted,” continued the statement. “Today the full-scale construction of new pipelines and compressor stations in the territory of the Russian Federation is already under way; contracts for the supply of pipes for the first two lines of the pipeline have been concluded. An agreement for the construction of the first line of the sea area, the laying of which will begin in 2014, has been signed." German firm and Gazprom partner Wintershall Holding GmbH has officially denied a possible change in the route: “Crimea’s entry to Russia will not affect the route of the South Stream gas pipeline,” said Mario Meren, a member of the company’s board. The interviewee also believes that the complexity of having to renegotiate contracts with Gazprom’s foreign partners, “who are also funding a part of the project,” is negligible – they would gladly have taken the chance to reduce their investment payback period, as rerouting the pipeline would have slashed their costs by half, calculated on a pro rata basis. Of greater import is the fact that, in the current climate, their political elites will not allow them do this. Igor Yushkov, the leading analyst of the National Energy Security Fund, also believes that adjusting the South Stream route is possible, starting from the second thread, and the delay, despite the obvious benefits, is primarily due to the geopolitical risks to relations between the West and Russia. “After all, the spending on a partial redesign and the renegotiation of contracts due to changes in the pipeline’s marine segment is simply minuscule compared with the economic benefits obtained,” says Yushkov. This is an abridged version of an article first published in Russian by Expert Magazine.